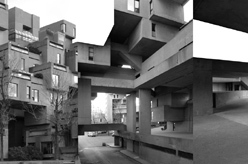 The residential compound Habitat 67 was planned and realized by Canadian architect and city planner Moshe Safdie during the years of 1966 and 1967 for Montreals Expo 67. Habitat 67 became an icon of the Metabolist movement inarchitecture; this movement, which emanated from Japan, sought to plan cities and architecture as organic, constantly self-renewing, life-supporting structures adaptable to changing needs. For a short moment and in the context of the urban Metabolist movement, this architectural ensemble symbolized a utopian counterpoint to modern concepts of the functional separation of life and work, of dwellings, recreation, transport and traffic. The exhibition Plugged in, Fenced out transfers the material of photographic research to a large-scale wallpaper, bitmapped in black and white. 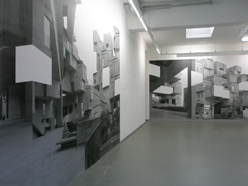 The representation of an alternative modernism (Habitat 67) is accompanied by modules and collages taken from architectural elements of the current failures of modernitys promise of universal progresstemporary container villages, provisional compounds, and mobile constructions that either enclose or exclude. The photographic material moves the viewer through spaces and perspectives, becoming a spatial dispositive that deals with architectures loss of a utopian imagination, as well as with the both humdrum and spectacular dystopias which currently characterize and shape our cities and urban experiences. Plugged in, Fenced out focuses on present-day processes of urbanization  processes determined by the logic of utility, flexibility, effectiveness and mobility, as well as by the neoliberal enclosure and privatization of city space. This work no longer poses the question of urban utopias, but rather directs a view to the inconspicuous, marginal, and the everyday and spectacular forms of contemporary metabolic processes (e.g. EURO 08 in Vienna) and poses questions as to the effect that these forms have on our urban experience. And thisalongside things architectural, social and politicalhas always been an aesthetic question: what images and conventions of viewing mediatize and legitimate these dystopic spaces? What underlying conditions of their production are hidden, what processes of cooptation and dispossession are made visible in the present images of space and space-productions? Can other possible urban worlds be imagined?